Orin squares is addictive puzzle game, similar to sudoku. In the beginning of a game, there is square board similar to chessboard. There are pairs of letters and numbers in some cells. Your aim is simple, complete the board, according to following rules: * Two same numbers or letters can not be in one row (eg. A1, A2, C3), * Two same numbers or letters can not be in one collumn, * There can not be two or more same pairs of letters and numbers (eg. 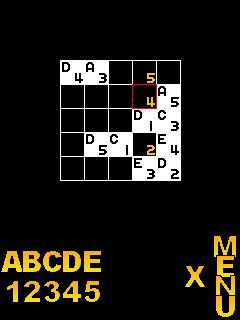 B5 and B5) Once the square is complete and no rules are broken the square become Orin square hence you finish the game. The pieces that are there at the start of a game can not be changed. You can distinguish them from other pieces by different background and font color. In lite version you can choose one of two difficulty levels - each of them means different size of board. They are 3x3 and 5x5.